In perhaps the most Mean Girls-esque moment of the second presidential debate on Oct. 9, an undecided voter in the audience asked Republican presidential nominee Donald Trump and Democratic presidential nominee Hillary Clinton if they could each, in turn, say one thing that they appreciated about the other. The laughter from the audience was a testament to just how heated both debates have been so far, with the candidates constantly interrupting each other and cutting down each other's characters. 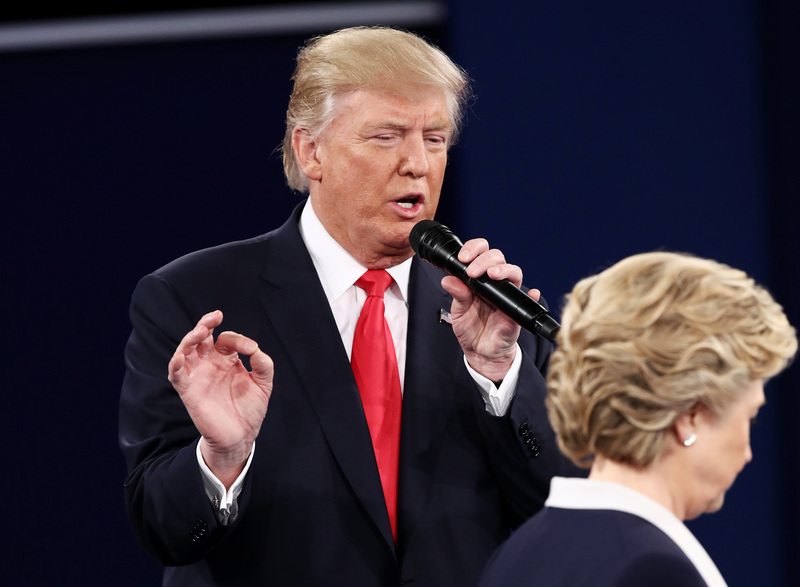 The question the voter posed, however, had an unexpected result — because although he buffered it with plenty of disparaging things, Donald Trump complimented Hillary Clinton with sincerity. "... she does fight hard, and she doesn’t quit. She doesn't give up. I consider that to be a very good trait," said Trump. In this moment, I can't have been the only person in the audience holding my breath, waiting for him to say something to quickly invalidate the compliment — a compliment that was, by all accounts, extremely feminist of a man who has openly bragged about sexually assaulting women and has made horribly sexist remarks about women's appearances. Given his track record of interrupting Clinton and his tendency to dodge answering direct questions during these debates, I anticipated that he would find some similar way to deflect this voter's question as well. I thought I would feel happy when he didn't — but instead, I feel more uncomfortable than ever. To some degree, there has been an ease in my ability to dismiss Trump not just as a candidate in this election, but as a human being. During this entire election cycle he has not said one thing I have identified with, and I often find myself wrestling with the idea of hitting "mute" when he speaks during debates just to let my blood pressure simmer down a bit. But for the first time, when Donald Trump complimented Hillary Clinton, I actually agreed with something he said — and the feeling is not sitting well with me. It wasn't just that Donald Trump said something respectful to Hillary Clinton. It was that Donald Trump said something that made him seem human to me. He said something that explained to me how he raised two formidable daughters. He said something that revealed that he is capable of acting with respect and civility. And he said something that inadvertently revealed that, despite this humanity he may have, he actively chooses not to act on it every single day. See, when Trump makes xenophobic and sexist comments, there is comfort in thinking he is ignorant and doesn't know any better. But there is sheer terror in thinking that he does know better, and acts against it anyway. It means that he doesn't lack knowledge, but lacks discipline. He knows how he should behave in this election, but chooses not to. He knows how he should properly address Clinton — how he would address all women — but doesn't. And this isn't just a testament to his character, but the world he has lived in. It is a testament to the privilege and abuse of power that was already so evident in his self-proclaimed evasion of federal taxes, in the leaked tape of him making horribly sexist comments to Billy Bush in 2005, in his deletion of past tweets and denial of past events that cast him in a bad light. It is a testament to how he would behave as a president — entitled, ill-prepared, and expecting the world to bend to his whims. There are a lot of people who heard Trump's compliment of Clinton Sunday night and may have felt softened by it, or at the very least have a grudging respect for him that they didn't have before. But I am not among those people. If anything, it has made me more sure than ever that this man should never be allowed near the oval office. He is not ignorant to his misbehavior; when he makes horrible comments and proposes damaging plans, he knows exactly what he is doing. And that methodical, persistent, and ugly kind of disrespect cannot be tolerated in anyone, but especially not in the leader of an entire nation.